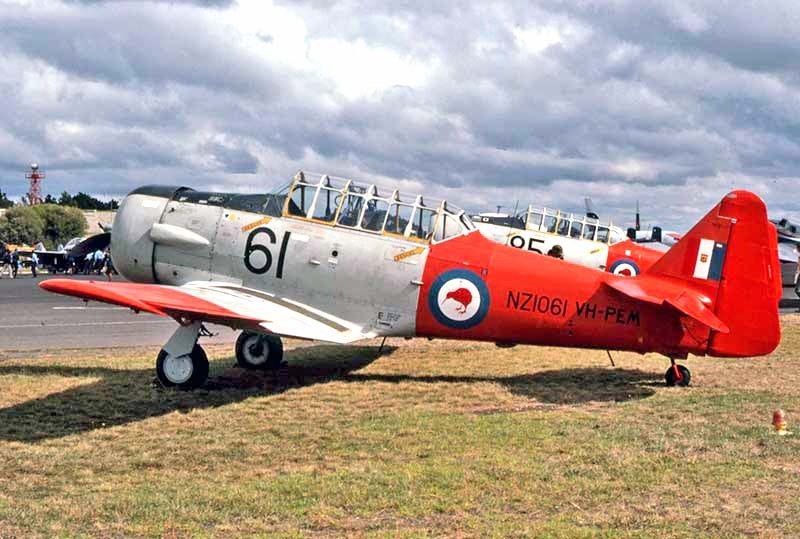 at home base Morwell-Latrobe Valley Airport, Victoria March 1983. 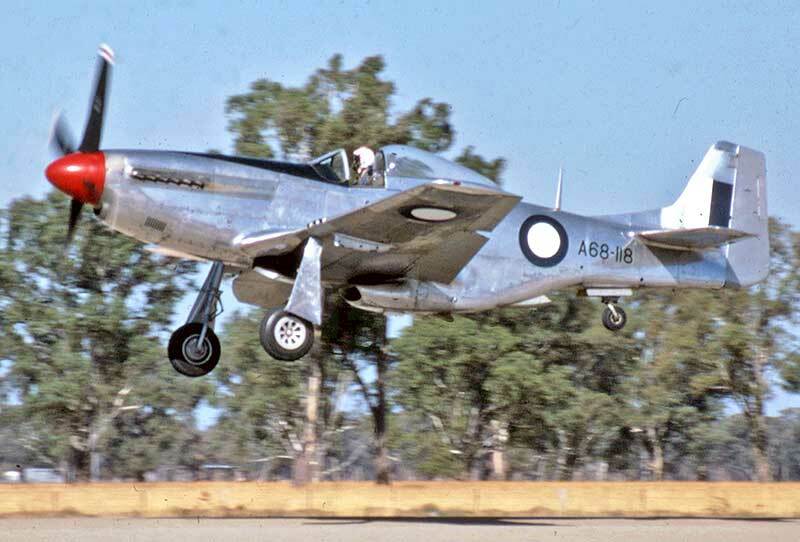 Jeff still has this Mustang today. 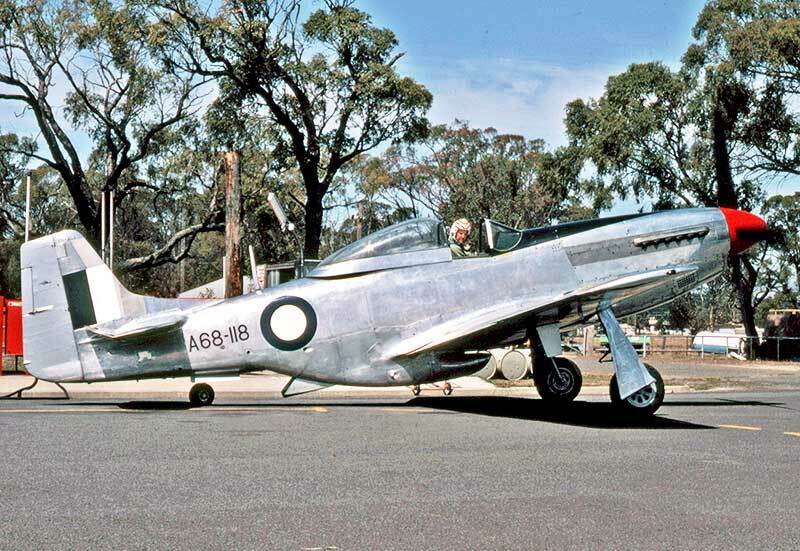 Mangalore April 1983: Australian warbird pioneer Colin Pay fires up his CAC Mustang Mk.21 VH-AUB (ex A68-107). 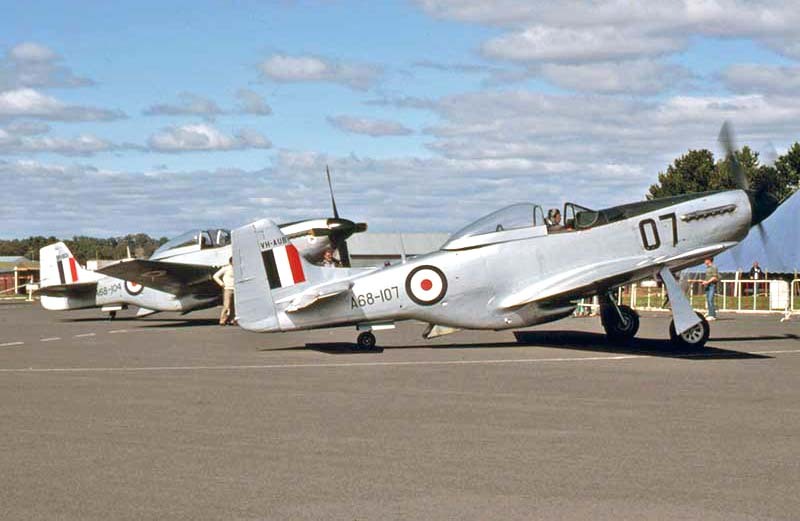 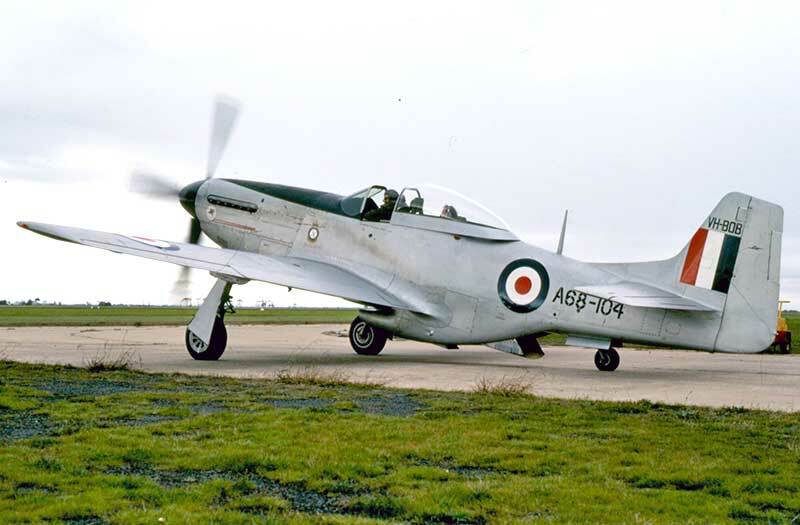 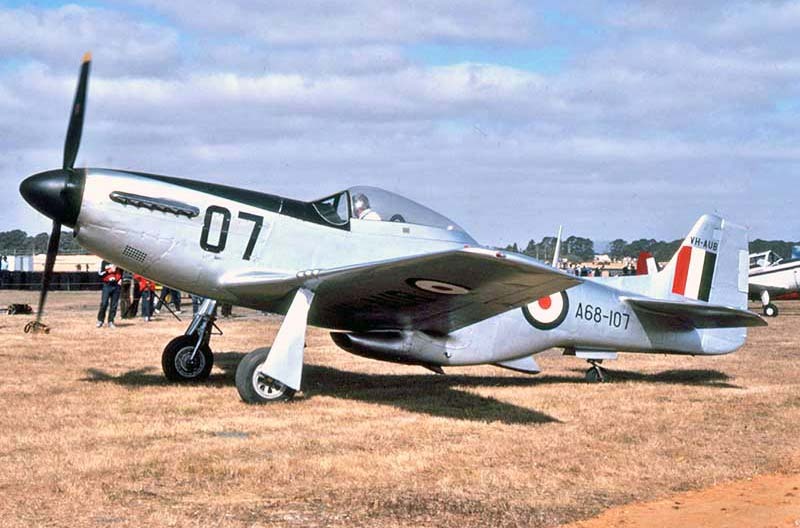 Bob Eastgate's CAC Mustang Mk.21 with a rear seat passenger, taxies for an evening flight, Point Cook June 1983.
restricting civil flying of military aircraft were relaxed, resulting in abandoned Winjeels becoming popular restoration projects. 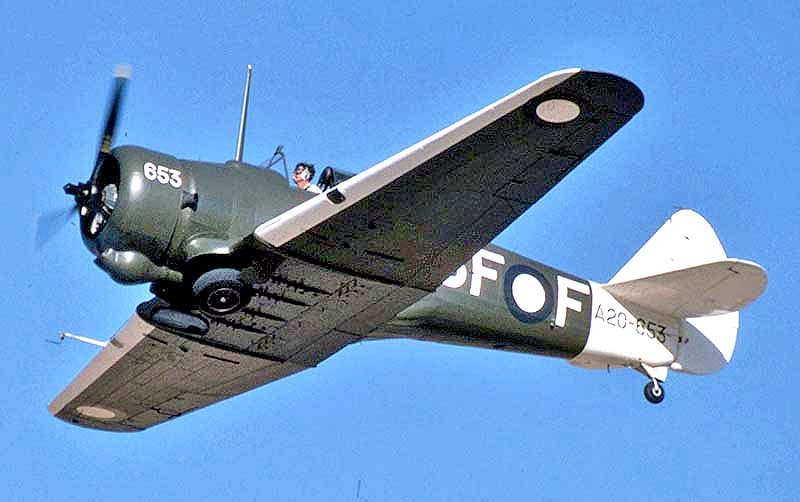 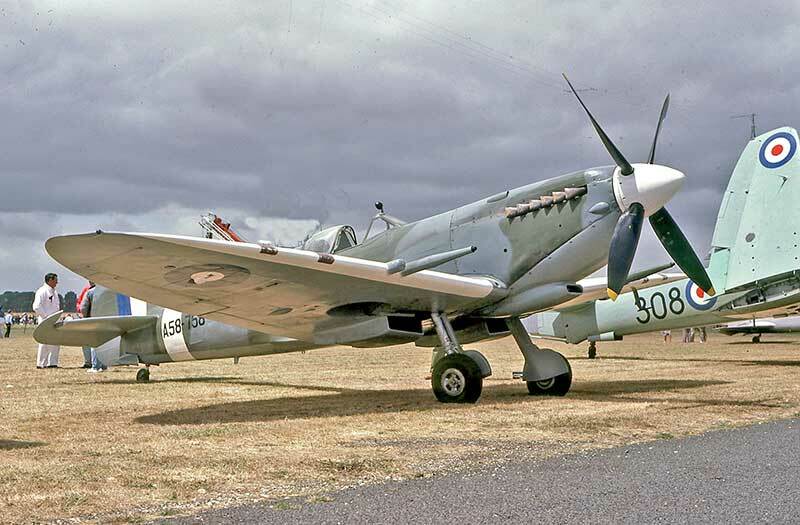 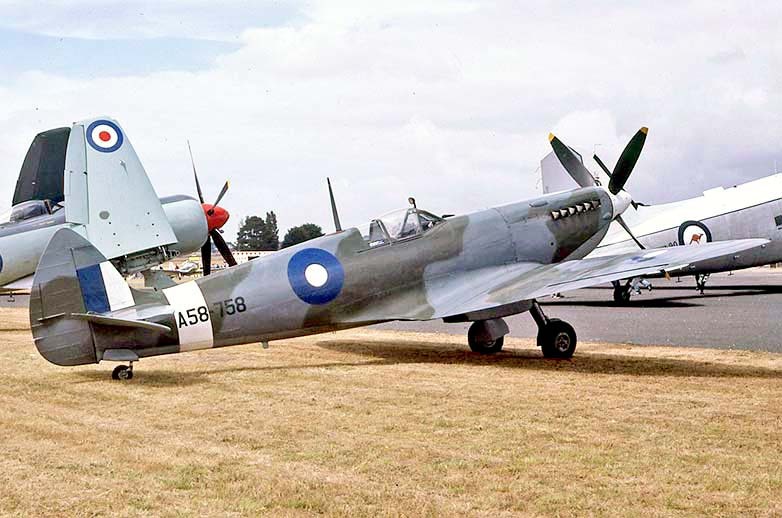 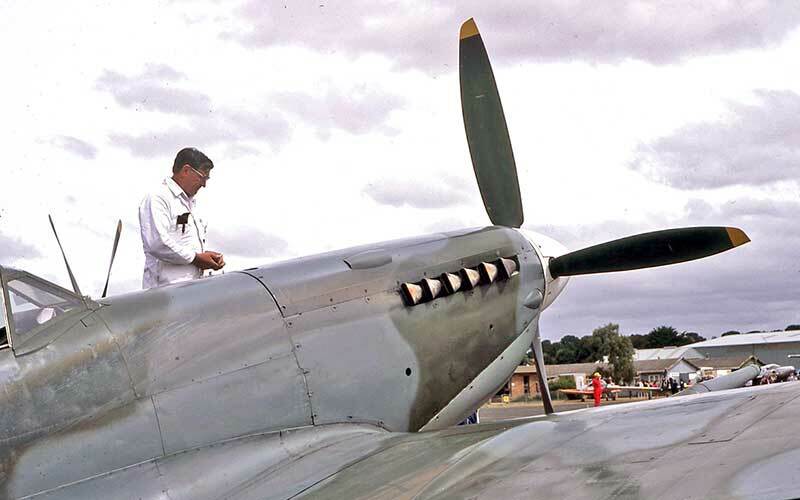 Colin Pay restored the first airworthy Spitfire in Australia at his Scone NSW aerial agricultural business. 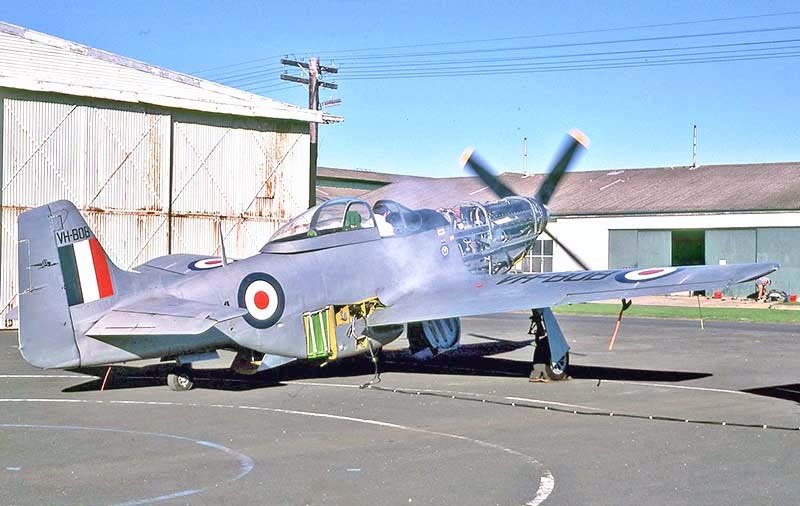 but stored in its shipping crate at RAAF Richmond until going to Sydney Technical College at Ultimo in 1949. 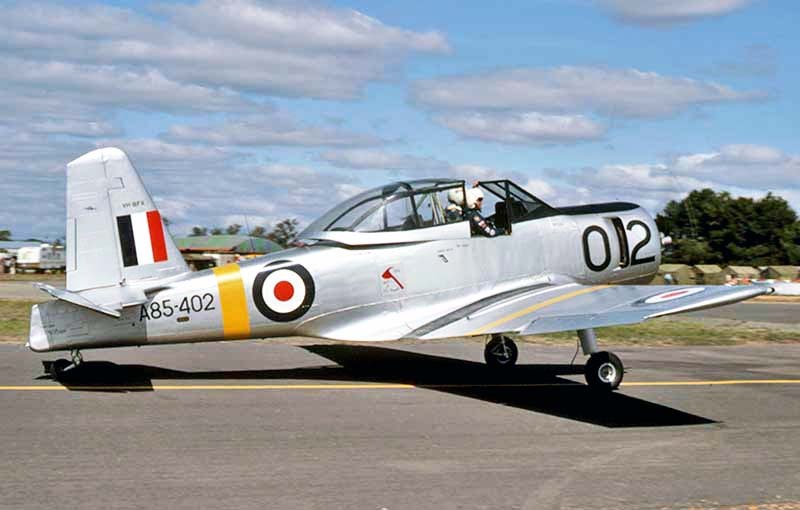 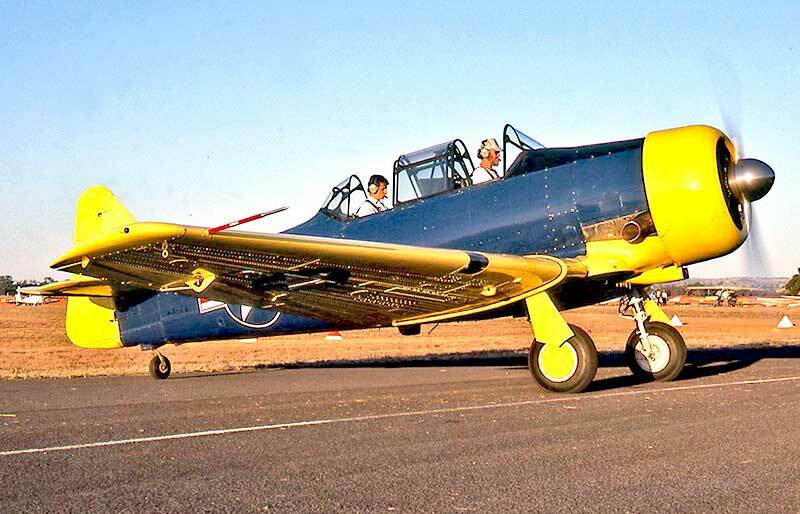 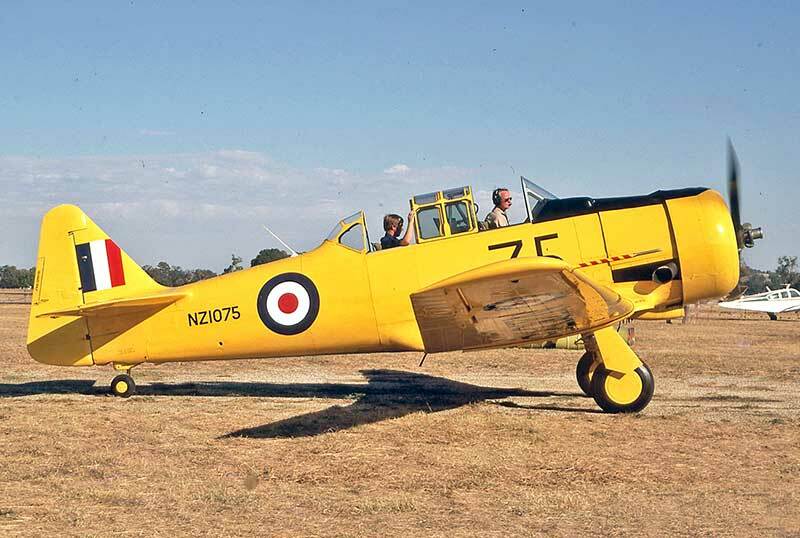 Royal New Zealand Air Force Harvard disposals during the 1970s were an attractive purchase for Australian owners. 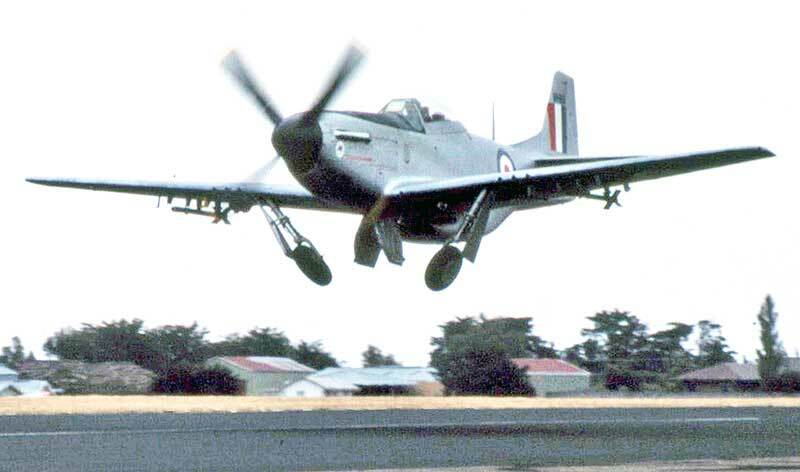 Some were delivered across the Tasman under their own power, others were imported as incomplete restoration projects. 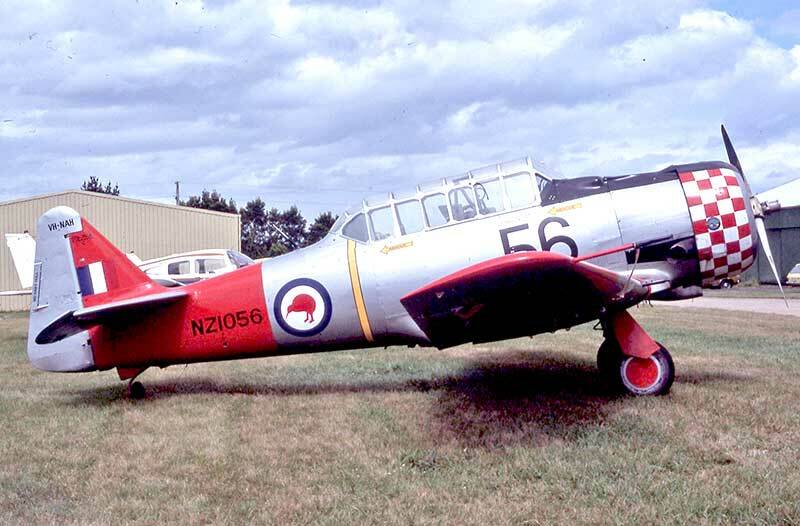 VH-SNJ (ex Harvard III NZ1085) was ferried to Melbourne via Norfolk Island in May 1979. 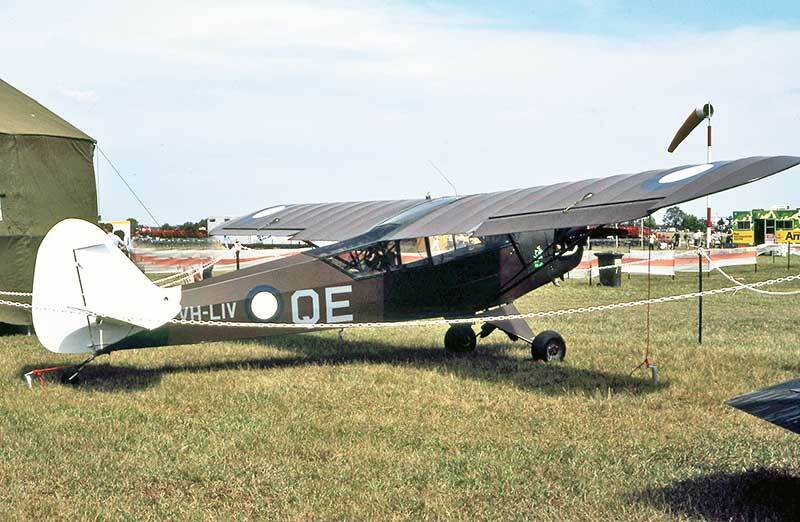 Seen at Mangalore April 1983. 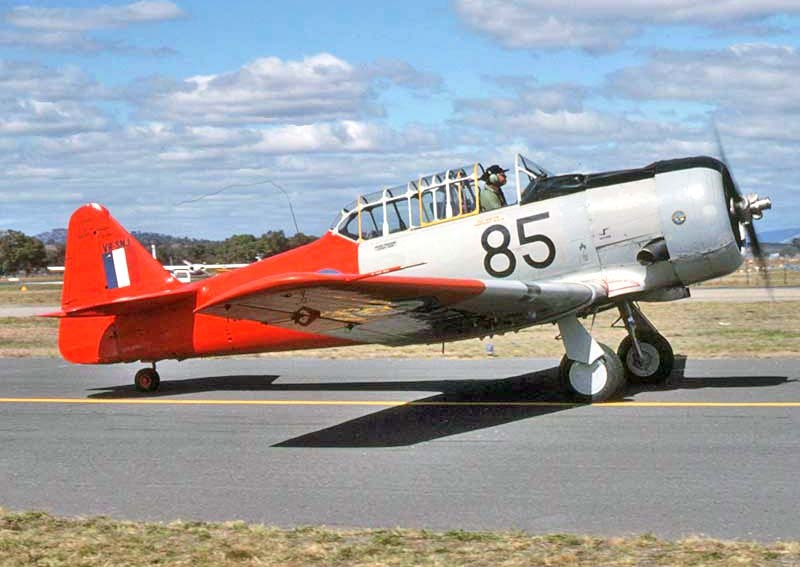 Col Pay taxies his T-6G VH-HAJ at RAAF Richmond NSW in October 1988. 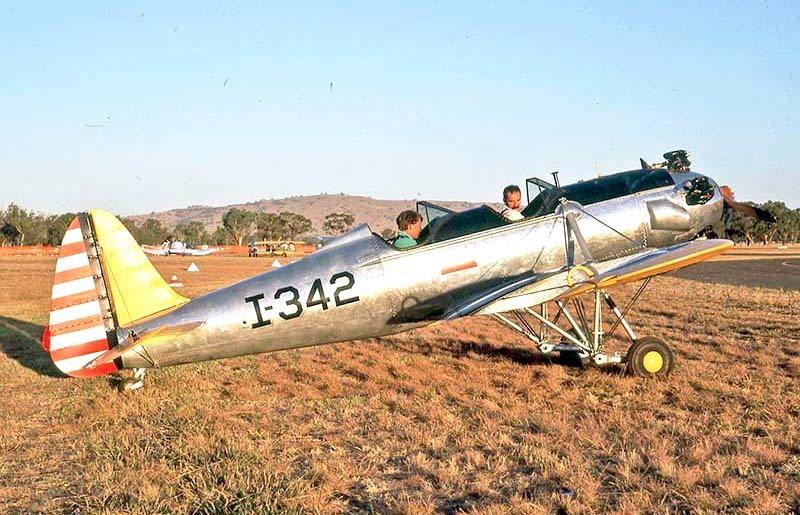 N13AA at Mangalore March 1986 had been shipped to Sydney from California. 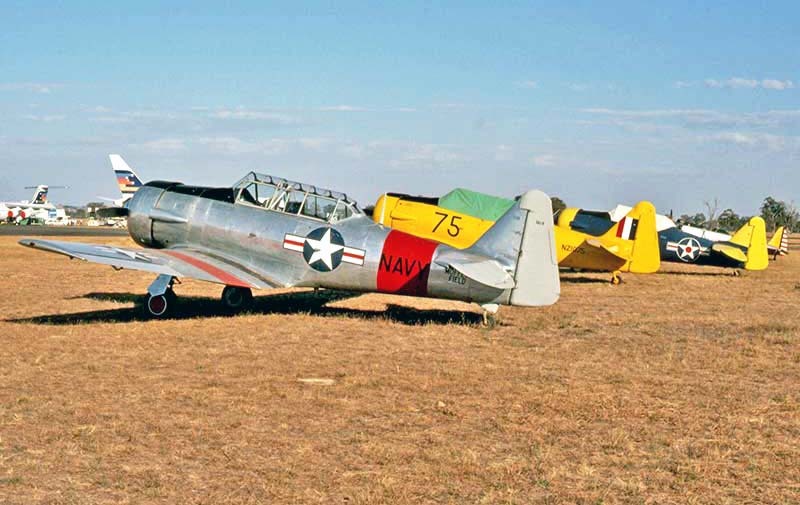 It became VH-USN the following week. 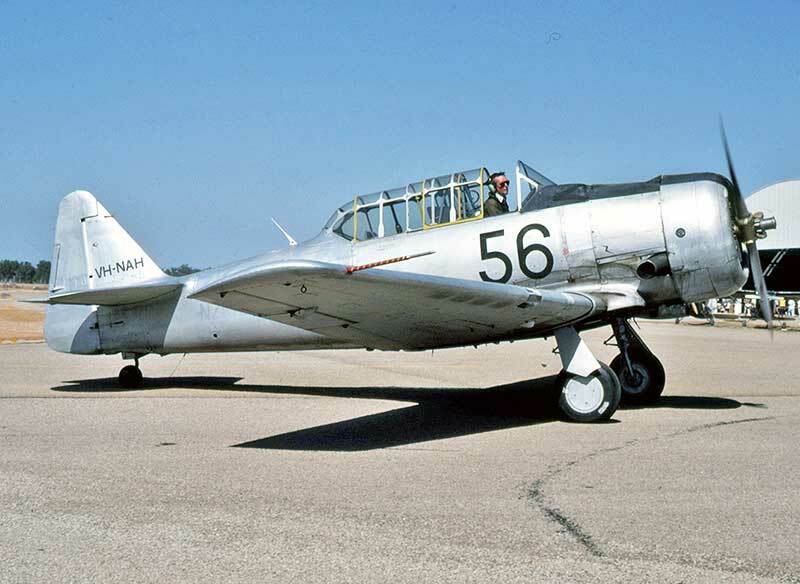 It is a former US Navy SNJ-5, diverted from USAAF AT-6D wartime production. 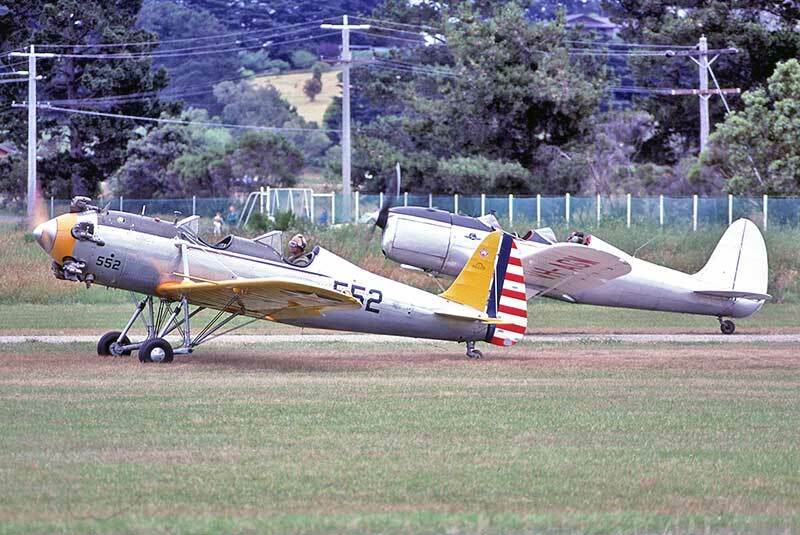 Charles Kingsford-Smith movie. 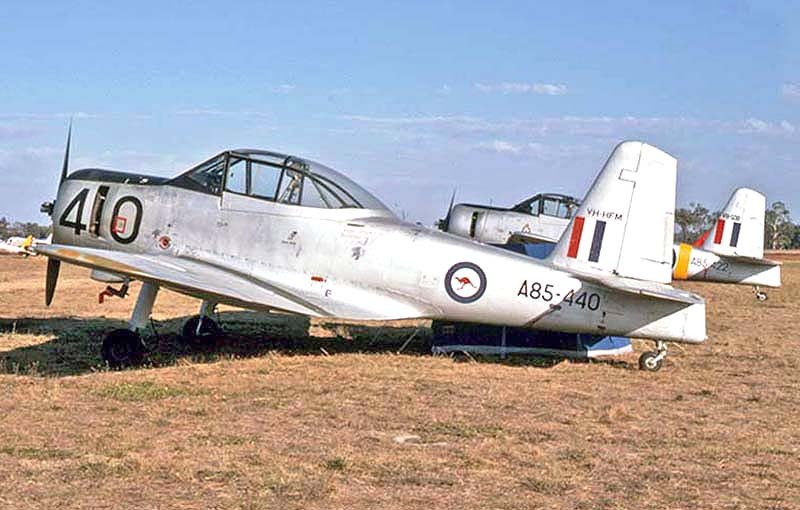 It is seen visiting Ballarat Vic in February 1987, before being registered VH-USR. 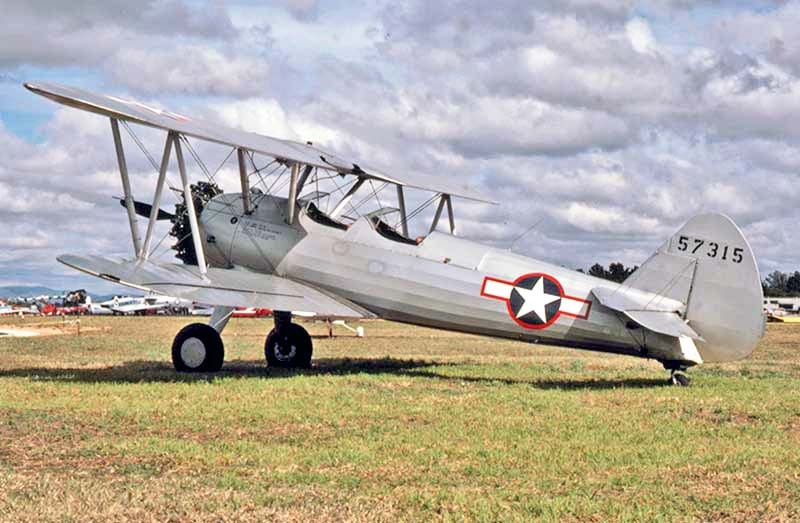 Boeing Stearmans were used in large numbers for pilot basic training by the US military during World War Two. 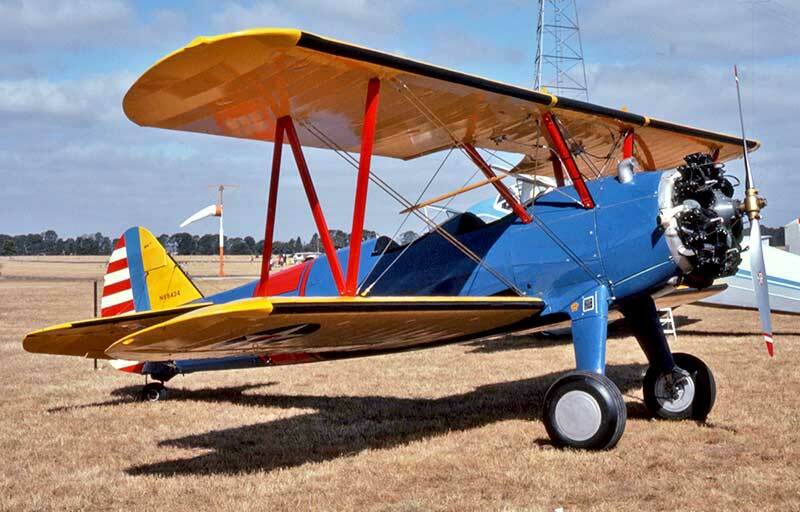 Following the war, disposals Stearmans were popular across USA as agricultural machines with more powerful engines. 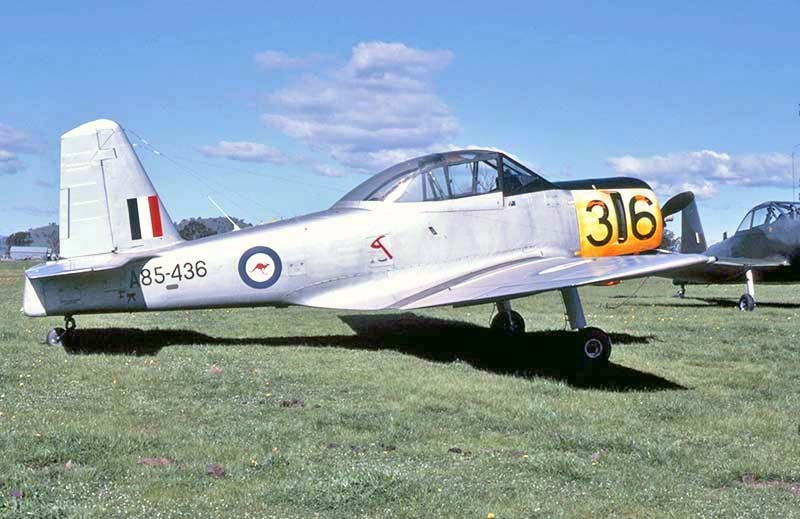 After a long rebuild it flew at Berwick Vic in October 1984 and is seen at a Ballarat airshow in February 1985. 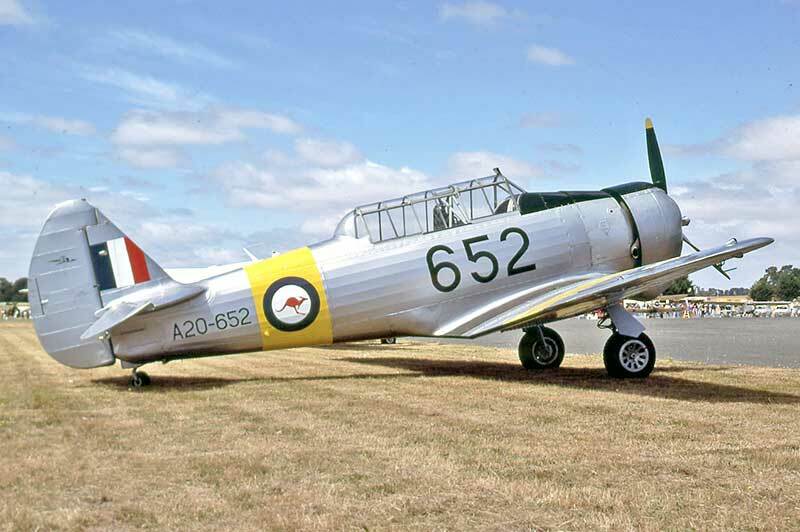 Meanwhile the first warbird Stearman to fly in Australia was Jeff Trappett's VH-AGR in 1981, ex N5047V. 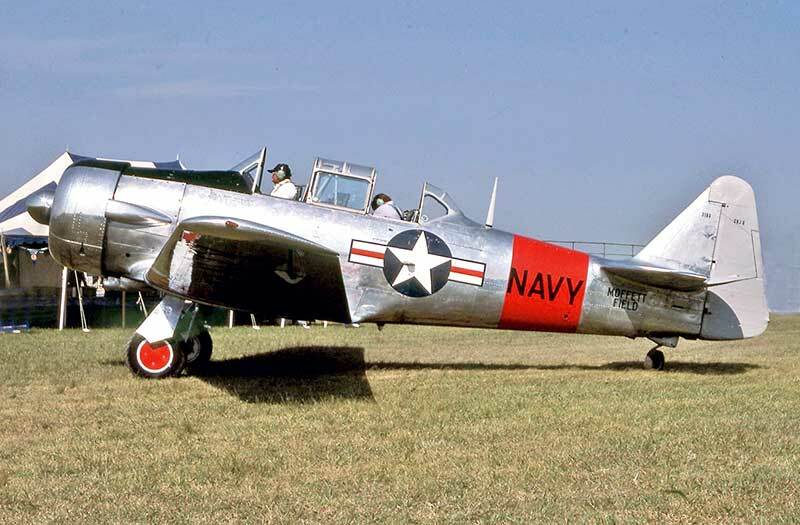 Another US military wartime trainer was the Ryan PT-22 Recruit, with closely-cowled Kinner radial engine. 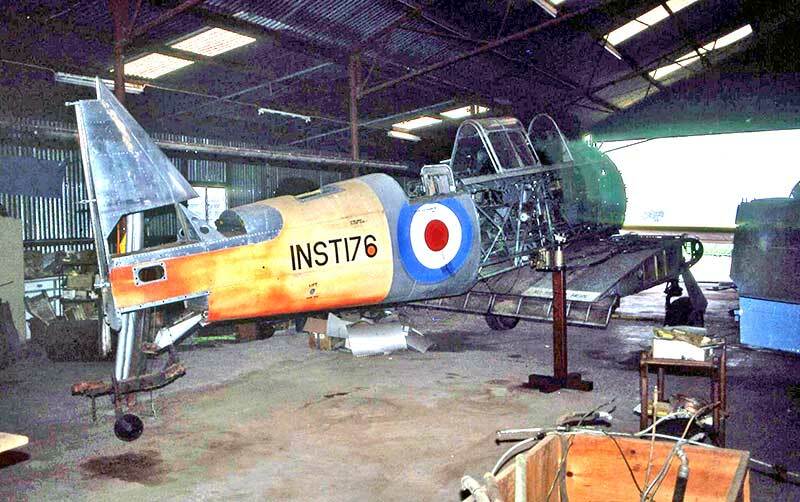 referred to as "liaison" in the US. 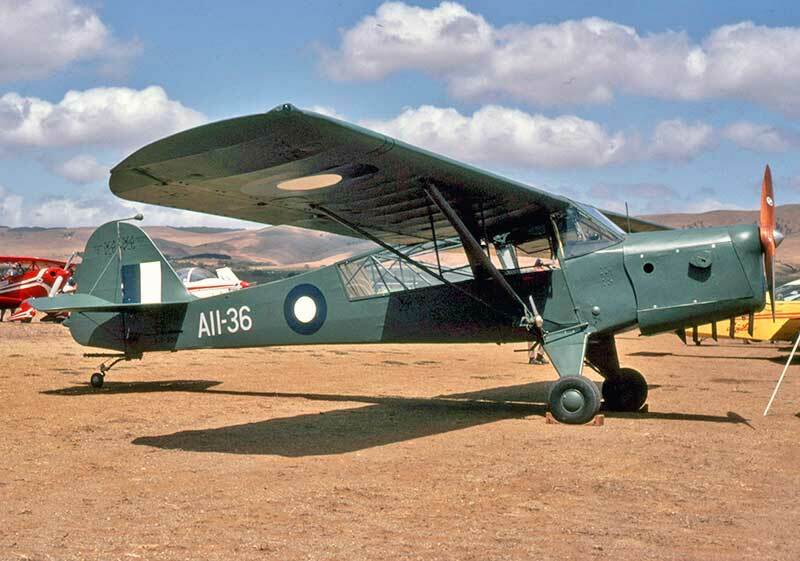 This was built for the USAAF as an L-4 Grasshopper, later civilianised as a J3C-65 Cub. 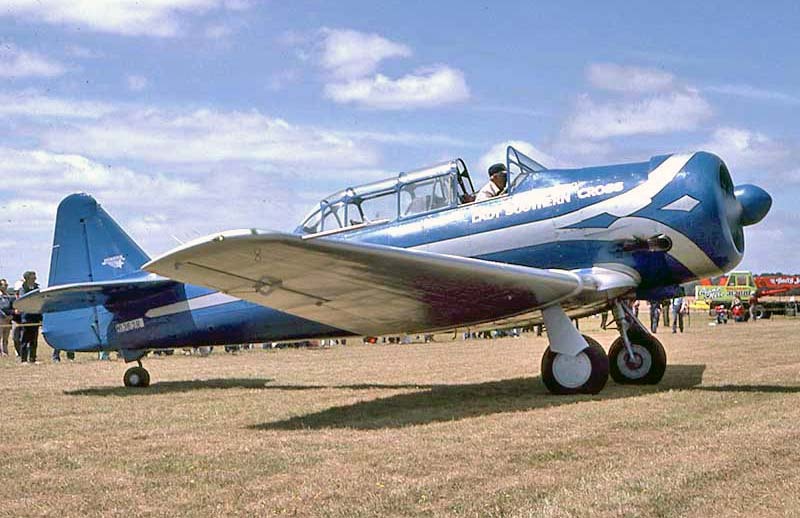 It was among a number of civil Cubs imported from Philippines by a Queensland dealer during the 1980s. 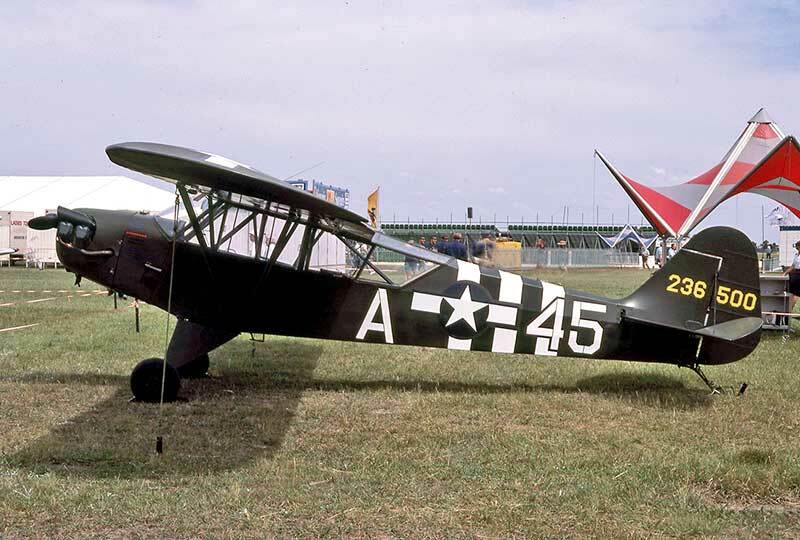 Richmond October 1988 airshow: this USAAF Piper L-4J civilianised as a J3C-65 Cub was also a Philippines import. 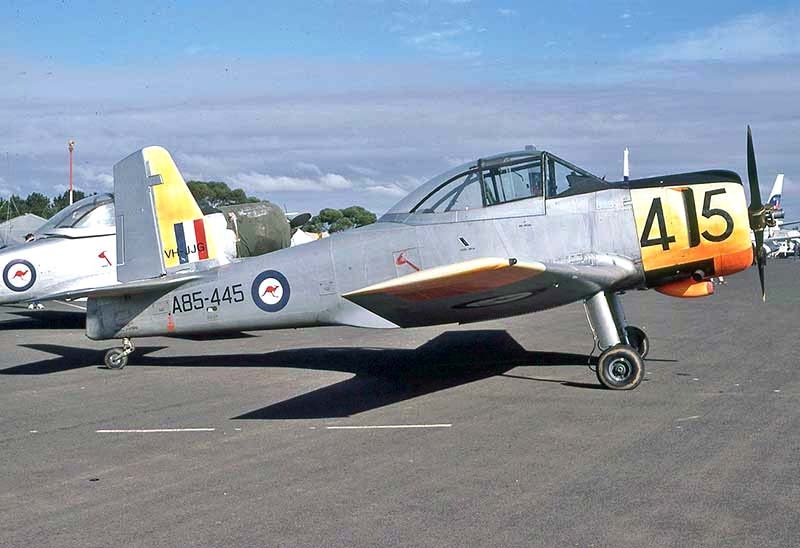 The paint scheme represented an artilliary spotter attached to RAAF No.4 Squadron in New Guinea during WWII.